Metres away from the water with spectacular views across to Point Nepean the traditional battened fibro cement shack has grown. This large house has been zoned for couples, family and friends. 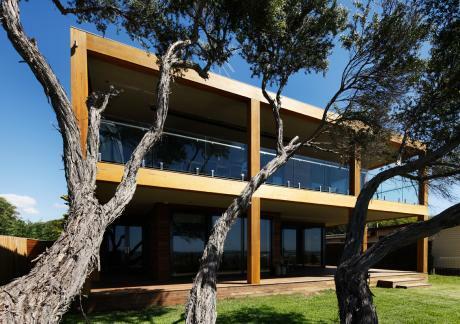 Occupying most of the site the long rectangular two storey form is elongated and carved away to give an internal private open space richly lined with timber and punched through with long uninterrupted views of the water from street side to sea.